SINGAPORE (Aug 28): Most emerging Asian currencies slid on Friday and were headed for weekly losses despite extended stock market rallies indicating that sentiment remains fragile amid worries about uneven global growth. The Thai baht hit a near 6½-year low as the central bank relaxed rules on overseas investments and said the currency reflects weaker economic fundamentals. Northeast Asian currencies bucked regional depreciation with China's yuan sharply up as the central bank was spotted intervening to support the currency, traders said. The Taiwan dollar and the South Korean won rose to their highest in about two weeks on exporters' demand for month-end settlements. Asian shares extended gains with China's equity markets up more than 3%. US stocks also jumped due to revised data showing the world's largest economy grew faster than initially thought in the second quarter. The upbeat US data came when concerns mounted over a deepening slump in the Chinese economy, which has been hurting its neighbours and other developing countries. "Concerns about China's economy continue to act as a major weight on EM sentiment," Barclays analysts said in a note. "This suggests any rebound will be difficult to sustain in the short term. EM currencies have found some respite but sentiment is likely to remain cautious." A plunge of more than 20% in China's stock markets over the past week aggravated worries on a slowdown in the world's second-largest economy and pushed global financial markets into a turmoil. With the market rout and pessimism on China, some US Federal Reserve officials including Kansas City Fed Bank President Esther George expressed caution on a near-term interest rate hike. Investors are keeping an eye on more comments on policy normalisation from Fed officials attending the Aug 27–29 Jackson Hole Economic Symposium. "I don't expect dovish comments, but they will keep their options open," said Khoon Goh, senior FX strategist for ANZ in Singapore. "Though things seem to be settling in now, a case can be made for the Fed not to rush." "Asian currencies should find some stability, especially with China keeping a firm grip on the yuan. But the underlying demand for dollars will return." The baht fell as much as 0.8% to 35.90 per dollar, its weakest since March 2009. Thailand's central bank said a weaker baht is supporting economic growth and it saw limited room for further policy easing, suggesting its preference of currency depreciation. The Bank of Thailand also will allow Thais having more than 100 million baht to directly invest in securities overseas, up to $5 million per year, from 2016. With Friday's loss, the Thai currency has fallen 0.6% against the dollar this week, according to Thomson Reuters data. 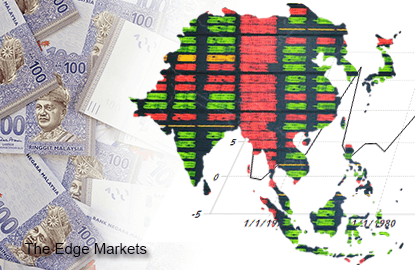 On Friday, the Malaysian ringgit was up, but for the week it has underperformed regional peers, having slid 0.9%. Among the bearish factors is sustained concern about a political crisis involving Prime Minister Najib Razak and indebted state fund 1Malaysia Development Berhad. Indonesia's rupiah has lost 0.6% on capital outflows and month-end corporate dollar demand. The central bank was spotted directly selling dollars on Thursday, not through agent banks, to support the local unit, traders said. The Philippine peso has fallen 0.6% and the Indian rupee by 0.3%. By contrast, the won rose 1.8% this week as North and South Korea on Tuesday reached agreement to ease military tensions.